Today we’ve partnered up with In The Raw® to bring you a classic fall recipe sure to become a new favorite in your home. There is something so joyful about baking for your family and friends, especially around the holidays. Traditional recipes, passed down from one generation to the next, baked with love for the people you love most. 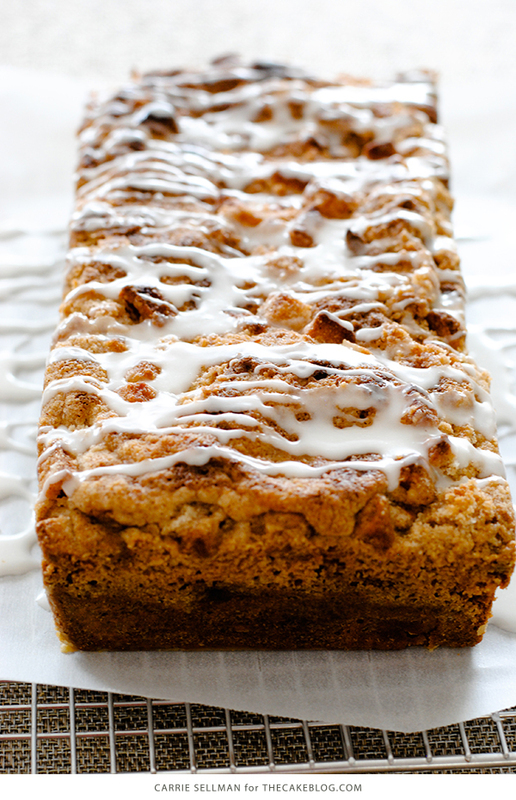 Today’s goodness starts with a classic crumb cake recipe, shared years ago by a family friend, and then takes a turn down extra-delicious lane when we add in chunks of fresh apple, the warmth of cinnamon and a double crumb topping. Yes, you read that right. Double crumb topping! There’s nothing overly fussy or complicated about this recipe. It comes together easily and bakes up beautifully, making it a great addition to your fall baking line up. Seriously, the hardest part is the waiting! 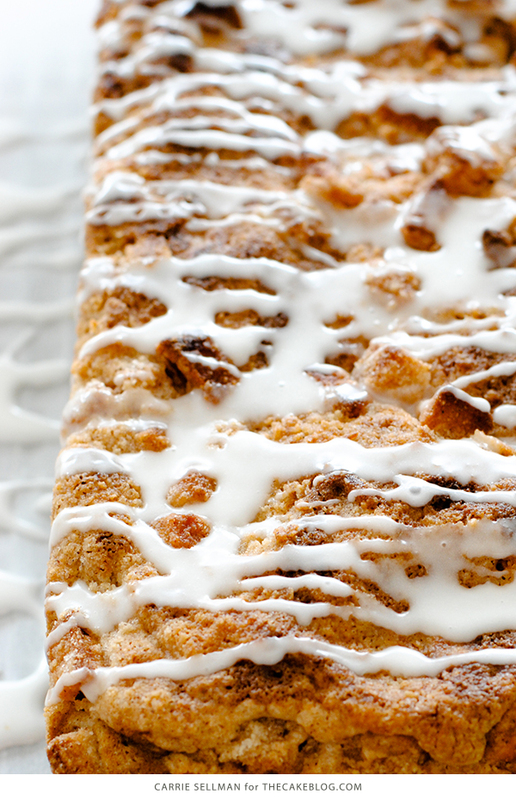 Because once you smell this apple-cinnamon goodness wafting through your kitchen, you’ll be dying to try a piece. Good luck letting it cool before your family digs in… if they are like my family, it will be sliced and eaten while still warm. Thank goodness we’re baking it up as two loaf cakes, so you’ll be able to eat your cake and share it too. Wrap up the second loaf and you have a delicious way to say thank you to someone special in your life. I asked Mr. Sellman if he thought this recipe was too heavy on the crumble topping. He responded by saying you can never have too much crumble! And I could not agree more. 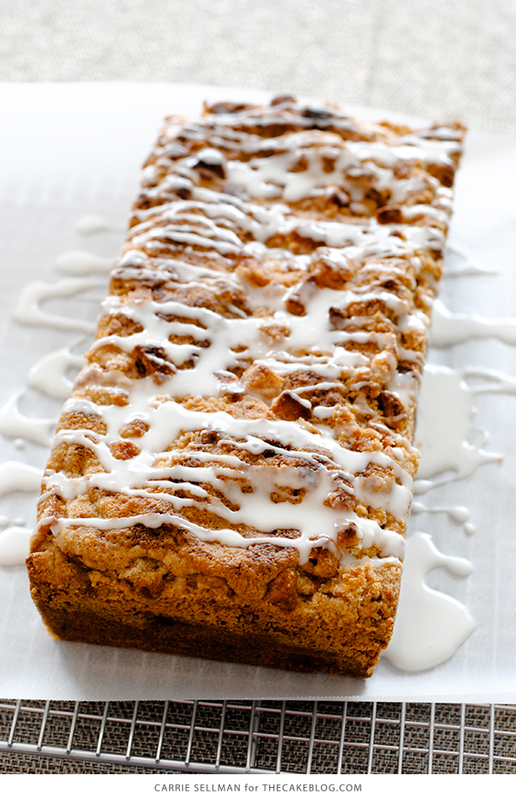 Who can resist a crunchy-sweet streusel topping with a subtle hint of cinnamon? 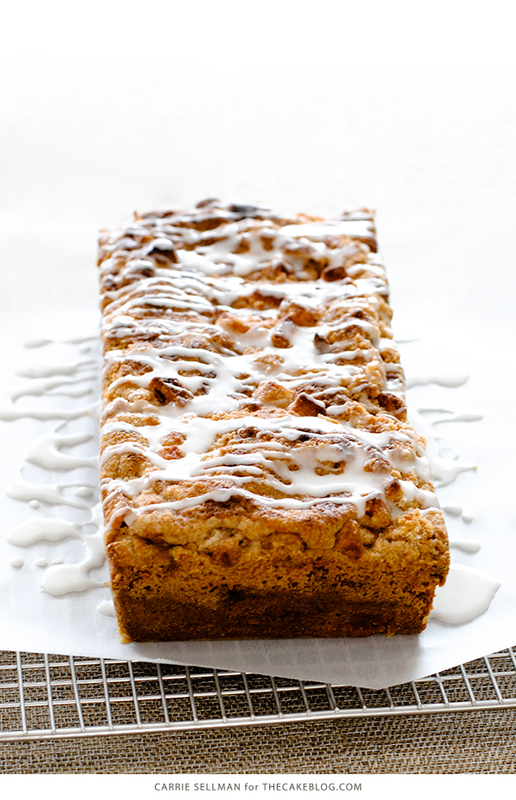 It’s the perfect companion to a cake kept moist and tender with chunks of fresh apple. Kind of like how Mr. Sellman is my perfect companion…. I bake it, he eats it! I’m so thankful for my guy and all of his taste-testing over the years. It’s a hard job, but somebody’s got to do it! And I’m super glad it’s him. Not only did I jazz up this crumb cake with apple chunks and double crumble, but I swapped out the traditional sugar with In The Raw®’s new organic white sugar. Sugar In The Raw Organic White® is the newest member of the In The Raw® family of products. It still has that signature unbleached color we know and love from the original Sugar In The Raw® , but its finer crystals make it perfect for cooking and baking because it can blend easily into any recipe. I gave this sugar a try in my Pumpkin Cake with Cinnamon Cream Cheese Frosting and thought I’d give it another whirl in today’s recipe as well. It incorporated beautifully in both recipes and I especially loved it in this crumble topping. 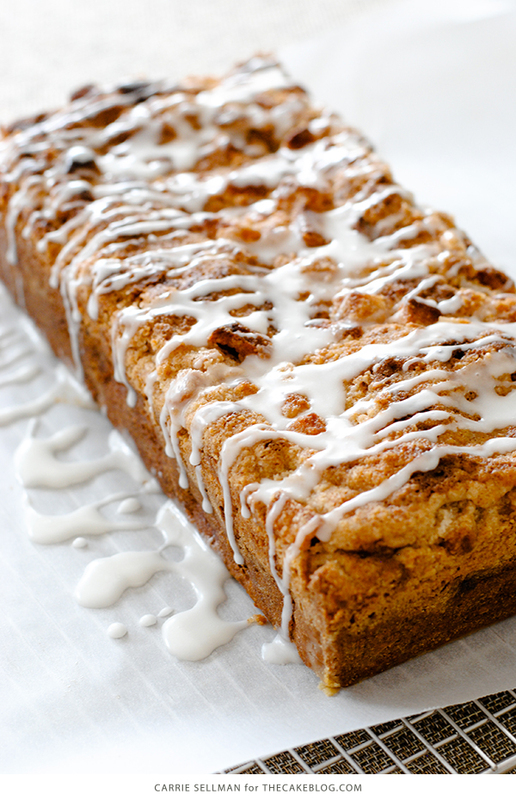 Now, go bake up this baby and fill someone’s day with the pure joy of homemade Apple Crumb Cake! In a large bowl, combine flour, sugar, cinnamon and salt. Using a pastry cutter or fork, work in butter until mixture is pea sized. Stir in apples. Refrigerate until ready to use. Preheat oven to 350 degrees. Prepare two 9×5″ loaf pans with butter, flour and parchment paper. Set aside. In a large bowl whisk together dry ingredients: flour, baking powder, baking soda and salt. Set aside. In the bowl of a stand mixer, beat butter and sugar on medium-high using the paddle attachment. Cream until pale and fluffy, about 4 minutes. Scrape down the sides and bottom of bowl. Add eggs, one at a time, beating well after each addition. Add vanilla and blend to combine. With the mixer on low, add one third of the dry ingredients. Then add in one half of the sour cream. Add another third of the dry ingredients. Add the remaining sour cream followed by the end of the dry ingredients. Mix until just combined. Divide batter evenly between prepared pans. Top each pan with the crumble mixture. Bake for around 50 minutes, until a toothpick inserted in the center comes out clean. Let cool for about 15 minutes and then remove cakes from pans. Place onto a rack to cool completely. In a small bowl, mix together sugar and milk with a fork until smooth. 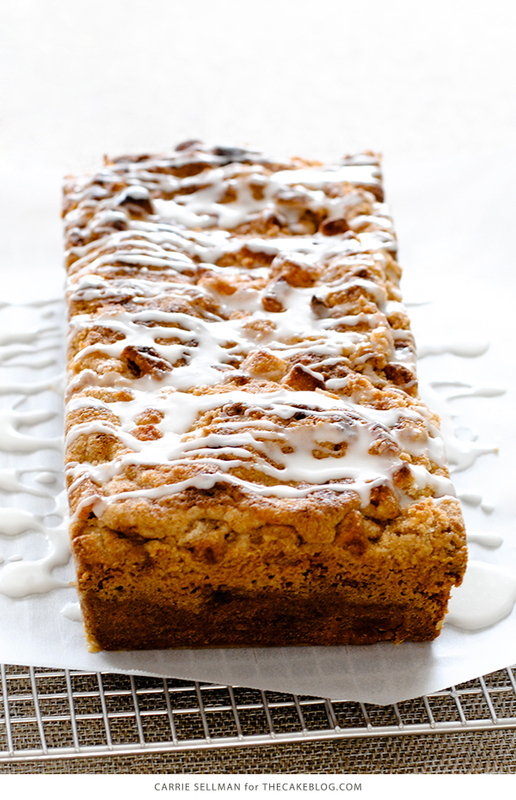 Once coffee cake has cooled, use a fork to drizzle glaze over the top. Let rest for 5 minutes for the glaze to set. Slice and serve with a cup of coffee or hot tea. In The Raw®, where sweetness runs in the family. Disclosure: Compensation was provided by In The Raw®, via Mode Media. The opinions expressed herein are those of the author and are not indicative of the opinions or positions of In The Raw®. Recipe and photography by Carrie Sellman for The Cake Blog. What kind of apples did you use in this recipe, sweet or tart? Hi Jackie! I used Pink Lady apples and it was delicious! They are tart and firm creating the perfect contrast to the sweet crumble. Honeycrisp or Granny Smith apples would also work nicely. What do you do with the apples? Do you put them in the batter, or spread them on to, underneath the crumble? Thanks for asking Laura! You fold the apples into the batter at the end. I’ve updated the recipe to clarify this step. This sounds delish! Does it need to be refrigerated or can it be stored at room temperature in airtight container? Thanks. Room temperature is fine! You can loosely cover it with plastic wrap and it will be fine on your counter for a few days. The apple helps keep it moist. Instructions say to prepare pans with butter, flour, and parchment paper. Are we supposed to butter and flour the parchment paper and then place in the pan? You’ll want to butter your pans, lightly dust them with flour tapping out any excess flour, and then line them with a piece of parchment paper. I like to use a long piece of parchment that hangs over the edges so that I can use the parchment like handles to pick the cake up and out of the pan after cooling. Hi Carrie! I just made this, and all I can say is YUMMMMMMY!!! I used Fruyo Vanilla yogurt which is low in fat, instead of the sour cream, and I omitted the vanilla. I used Granny Smith apples because thats the type of apple we like. Thank you for this delicious recipe. Definitely a keeper…. So glad you liked it Rima! I love the idea of using yogurt and Granny Smiths. Thanks for the feedback! My all time favorite. Great recipe. Thanks for sharing. I just made this Apple Crumb Cake yesterday and I have to say it’s probably the best loaf cake/quick bread that I have ever made. I used Turbinado sugar in the crumb topping – larger grains gave slightly more crunch. I left the apples out of the topping as I wanted to preserve that crunchiness. I used half white sugar, half dark brown in the cake itself along with Honeycrisp apples. The batter is thick and when divided into two pans, it seems like a small amount to make the loaf. But – and here is the best part of this cake – there is almost as much crumb topping as cake batter! Not a measly thin sprinkling of crumbs, here…this is a grand thick layer of delicious buttery goodness!Fantastic! Next time I will try it as written with the apples also in the topping and see which way I like best, but it was lovely even with the plain crumb topping. Oh, and by the way, I’m lazy when it comes to preparing pans – I used a canola oil spray in my (glass) pans. No butter, no flour, no parchment. The loaves slid out easily with no sticking whatsoever. Thank you so much for the recipe! Wow, thank you for the wonderful feedback Peggy! i Have pans that are small squares (12) per pan do you think I could use them instead of loaf pans? I like the thought of individual desserts. Thanks.